Come to the Bedford Free Library on Wednesday, February 27th, at 7pm for a very special evening with Will Schwalbe! 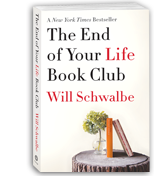 Bob Minzesheimer covers The End of Your Life Book Club for USA Today. Jill Krementz covered the launch of Will’s national book tour at the Barnes and Noble on NYC’s Upper East Side. See her story and photographs here. Andrea Baillie of The Canadian Press covers The End of Your Life Book Club for the Metro News. Will Schwalbe spoke with Anna Maria Tremonti on CBC’s The Current. Check out the audio here. Check out this feature about Will and The End of Your Life Book Club in Women’s Wear Daily.